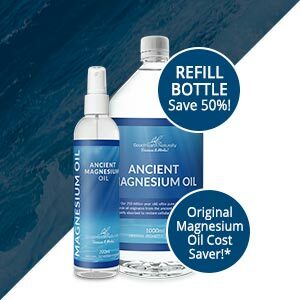 From the depths of the ancient Zechstein Sea, we bring you our brand NEW Ancient Magnesium range made using only the purest Zechstein magnesium chloride. This highly potent, ‘ultra pure’ magnesium chloride is extracted from the ancient Zechstein Seabed, approximately 2km beneath the surface of the earth. Some 250 million years ago, the Zechstein Sea was a concentrated saltwater sea, with many of the characteristics of the Dead Sea today. Magnesium chloride, a natural magnesium salt, was plentiful in this sea and concentrated by a combination of flooding by sea waters and slow evaporation. Over time, these dense waters found their way deep into underground deposits slowly accumulating through fissures in the earth over millions of years, trapped underground by overlying rock. Though the Zechstein Sea itself no longer exists today, the Zechstein salt beds are a perfectly preserved snapshot of pure magnesium chloride as it existed in its natural state, millions of years ago. Zechstein magnesium chloride is known as the original, gold-standard transdermal magnesium and used by trusted professionals. Ancient magnesium products offer a convenient form of transdermal magnesium, meaning “through the skin”. Transdermal is nothing new, as many examples can be found throughout the centuries and from different cultures. Transdermal is an easy “do it yourself” method of magnesium supplementation. Magnesium is our fourth most abundant mineral, and we can’t live without it. We may need more magnesium during pregnancy and lactation and in times of stress or injury. What about getting magnesium from food? Some of the richest sources of magnesium (per serving) through food include: mackerel, spinach (boiled), artichokes, okra (boiled), quinoa, almonds, cashews, and pumpkin seeds. However, most of us don’t meet our Recommended Daily Amount (RDA) because of agriculture, soil, and diet changes over the last century. Adults, children, pregnant women, nursing mothers and the elderly need a steady supply of magnesium daily. 60% REDUCTION IN FOOD IN THE PAST 50 YEARS. What about powders and tablets? Not all types of magnesium deliver the same benefits. Magnesium oxide, the most common form sold as a tablet or capsule, has been shown to have a low absorption rate and can create a laxative effect. 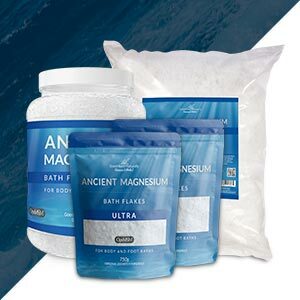 Magnesium chloride (found in all Ancient Magnesium products) is viewed by many as the “master magnesium compound” due to its high potency and efficacy. * Further info can be obtained via Naturally Healthy Publications study references. Unearth even more remarkable health benefits in your FREE DOWNLOAD of Robert Redfern’s Magnesium Manual below! 5ml contains 130mg elemental magnesium, and 650mg OptiMSM and 5mg CBD oil. 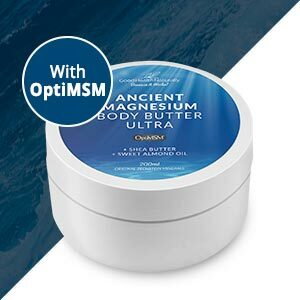 Our award-winning magnesium cream with OptiMSM and CBD oil is 100% natural, safe and non-intoxicating. 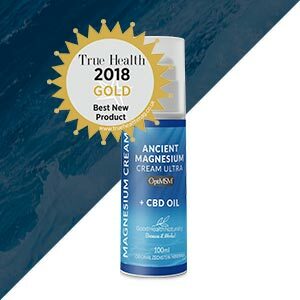 Successful testing has shown that the unique combination of CBD oil with the combined benefits of magnesium could help provide relief from pain, skin disorders, mental health and much more! 20 sprays per day contains approx 335mg of elemental magnesium. Delivers the highest dose of 100% genuine Zechstein magnesium chloride per serving to support energy, muscle and nervous system function, teeth, heart, bones, cell regeneration and more. * 1000ml can be used as a refill to fill up smaller bottles again and again!. 20 sprays per day contains approx 300mg of elemental magnesium and 369mg OptiMSM. 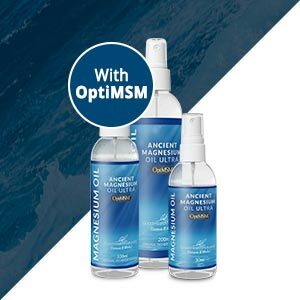 Combines all the benefits of original magnesium oil with added OptiMSM – The World’s purest MSM, for enhanced absorbability into skin and tissue. Helps naturally improve immune response, faster recovery from exercise induced inflammation and much more! Ultra – 200ml: 5ml contains 130mg elemental magnesium and 650mg OptiMSM. Original – 200ml: 5ml contains 130g elemental magnesium. Melatonin – 200ml: 5ml contains 130g elemental magnesium, 650g OptiMSM, and 1.5mg Melatonin. Cool Relief – 200ml: 5ml contains 138g elemental magnesium. Our luxurious lotions combine ‘ultra pure’ elemental magnesium with shea butter, sweet almond oil, and other organic ingredients to help naturally reduce fine lines and leave skin looking radiant and feeling healthier. 5ml (one teaspoon) contains 130mg elemental magnesium, and 650mg OptiMSM. Replaces your daily moisturiser with added health benefits and rich hydration. 100% natural to provide the gentlest healthcare for your skin. Ultra 750g and Ultra 2000g: 100g flakes contains 10.75g magnesium and 8.5g OptiMSM. Original 750g and Orginal 3600g: 100g flakes contains 11.75g magnesium. 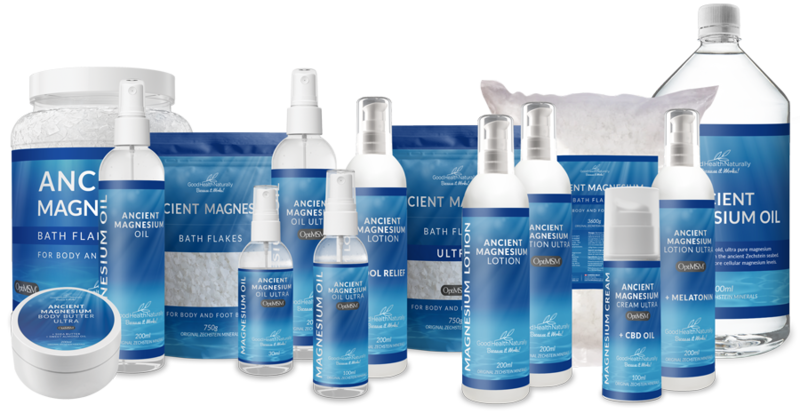 Ancient Magnesium bath flakes turn bath time into a therapeutic spa treatment. Provides a gentle way to get magnesium into your body to help relieve muscle tension and stress.